2018 update: The SeaCamper was a big hit last summer... we added 256sq foot to the dock and put a new Sibley 400 tent on it with a full size bed for Mom and Dad, and the kids can have a blast in the Boat. Can sleep up to 6 if needed. We also added a covered kitchen for shade and in case it rains. All the fun of BoatRVing without the fuel expense and campground rental. Private spot with an amazing view (this is not your normal RV park ;). We love to see pets join the vacation, but that doesn't change how clean we keep the boatRV. 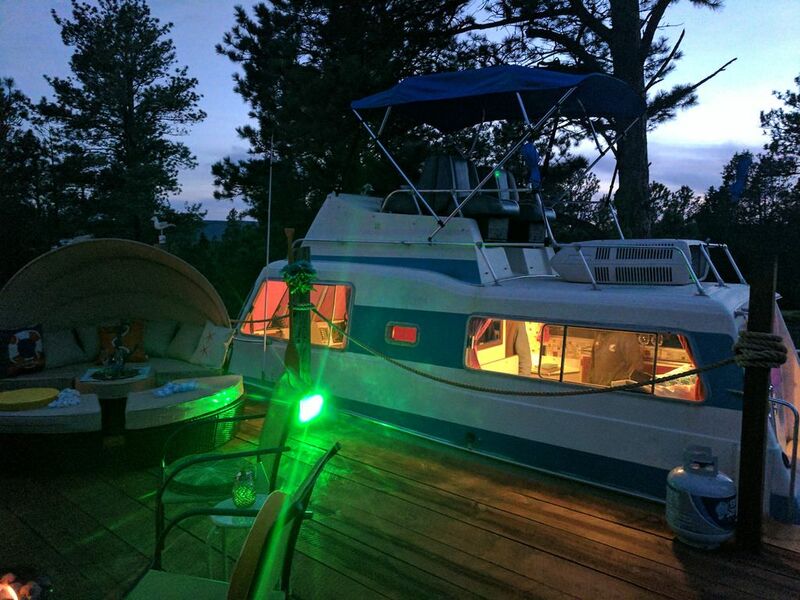 This is a new expansion site for 2017, that we are very excited for, Dock/Deck, Hot Tub, combo Grill, open air out side shower with privacy, dock bed, fire pit.... inside double bed, 2 singles, AC, small fridge, port-a-pot toilet.. Inside, Full size dinette conversion bed for 2, up front 2 bench beds or go up to the Flying Bridge and 2 can sleep under the stars or the bimini top. Enjoy everything from beautiful sunrises to amazing sunsets. SeaCamper is parked in a secluded area in the trees walk to the cliff, but still easy to get to with a car. Non-Smoking, but allowed at the fire-pit for fire safety. Just 5 beautiful winding canyon miles from Hot Springs. Coffee pot is included, either Keurig, Peculator or brewed, if you have a preference please let us know and we will have it ready for you. We are a product of on online dating. Patricia moved from MN to the Northern Hills in 1979. Wade was born in Spearfish, but was living in Colorado, counting days until the next time he could get back the 'The Hills'. When we found the property online, we fell in love with the house... and Wade the shop. But after we came to see it in person and walked to the cliff... well, it was just amazing. You have to see it in person to understand. Everyday, we tell our 3 dogs and 3 cats, 'we are going to the cliff' and we all take a hike together, stopping just to sit and look. Seems like every hike, we see something new, we never noticed before. We want every guest to feel right at home and provide everything you could ever need. We treat our guests as family... that traveled from across the country and have what they need to relax and prepare for the best vacation possible. We know most families only get 1 or 2 vacations a year, we are very honored to be a part of that experience. on dock/deck with million dollar views. on dock shower for easy cleanup. I loved my little piece of Heaven at the SeaCamper. It was a cold two days that I stayed, so I wasn't able to truly enjoy all of the amenities. But even with that being said, I loved the place. The location and the views were absolutely gorgeous. I loved the Sibley tent! Very relaxing and peaceful place! The seacamper was so unique and had a great set up! We loved everything about our stay! Patricia and Wade are super friendly and willing to help make things better anyway they can! (Although no need, as it was perfect already) Rental is fully equipped with all your basic needs, plenty of linens, ect. The bed in the tent was SO COMFORTABLE! Camp heater kept tent plenty warm, even when it dropped to 45 over nite and we had our 3month old son with us! Beautiful deck set up with so much fun decor, down to the last detail! Outside shower was plenty hot and was such a unique touch! We grilled every night and enjoyed the beautiful view from the snack bar! Hot tub was just a perfect way to end each night! And sitting under the stars or watching the sun come up over the Cliffside was incredible! Having our dogs be able to join us was also great! Plenty of space for them and we were welcome to explore the land with them too!!! Always nice to see other dog friendly people on vacation!!! Thanks for everything and we will definitely be back! Highly recommend to anyone we know traveling your direction! The outdoor shower was a nice touch. We left feeling refreshed. It was so peaceful and calm. We will do this again regularly. It had everything we needed. The hosts gave you your privacy but you knew if you needed something they would take care of it. Such a charming place. So thankful that there ate people willing to share their property this way. Amazing place. Had a blast. Will be back! We have nothing bad to say about our experience. We had a wonderful time and loved this place so much. It was an Awesome experience. We are already planning our next trip back!! !